Meneer Leegte (zijn naam beschrijft goed zijn denkproces) vergeet dat wij als Nederland voor een zeer groot gedeelte van onze welvaart en stabiliteit afhankelijk zijn van wat er in Duitsland gebeurt. Dat “dit niets betekent” is dan ook een lege kreet, want wat in Duitsland wordt besloten heeft altijd gevolgen voor ons. Hij sluit slechts de ogen voor het feit dat, hoe zeer hij ook een tweede Fukushima- of Tsjernobylachtige centrale in ons land wil plaatsen (waarom eigenlijk?) we links worden ingehaald door een aantal belangrijke buurlanden. En waar is het élan gebleven? “Ze zullen wel kernenergie gaan importeren………” wat een misselijkmakende negatieve pessimistische blik op de toekomst. Vergeten wordt waar het technisch vernunft van de Duitsers toe in staat is. Je kunt beter goed proberen dan fout blijven doorgaan, maar meneer Leegte vindt fout doorgaan een echt liberaal standpunt. Wij moeten ook het roer wenden en mee gaan doen met het Duitse initiatief. Dat levert kennis, inkomenst en en een schonere wereld op. In plaats daarvan wil de VVD (waar ik lid van ben) als een stel conservatieve oude verstilde zakken ons geld in de bouw van een kerncentrale steken, want iets anders durven ze niet. Maar met zo’n renteniersmentalieit komen we er niet. Most embedded software is written in C, and software written for ARM Cortex-M3 devices is no exception (pun intended). C has many qualities – small, clean, relatively easy to learn and above all a superior interface for performing low-level hardware operations – try writing a routine for manipulating I/O memory in Algol or Fortran …… Why, then, divert to C++ and its supposed steeper learning curve? The answer lies in the size of the software project you write. The price for using C becomes painfully apparent when projects grow beyond the “hello world” stage – the boundary usually lies around 1200-1500 lines of code. Writing a “hello world” demo in C is feasible and maintaining the source code is not hard. “Hello world” applications are in the order of 10-30 KBytes of Flash on Cortex-M3. However, many Cortex-M3 devices typically offer more than 256 KByte of Flash, up to 2048 KBytes of Flash. A typical “serious” project for such a device would employ a number of serial interfaces, would perhaps include an embdded web server, would do floating point calculations and would interact with a user through buttons or a touch screen. Such a project would require ten thousand lines of C code or more, which translates into upward of 200 Kbytes of flash programmable binary code. Maintaining order in this code, which is centered around C’s function-oriented set-up, is awkward and error-prone. Doing so with a large developer team is even harder, as I know from experience. In C, devices typically use structs which contain init and state information, but how do you know if and where all information is filled out correctly in 15000 lines of code? Also, manually calling init functions and combining common code into lower level function/data sets requires a lot of discipline from a development team. Most experienced C programmers confronted with situation will start to write code defensively, in an object-oriented approach, in order to prevent errors and bugs. In a way, they use C++features without using the proper tools. C++ offers everything you need to maintain order in larger embedded programs. Object Oriented programming was a focal point when the language was invented, without sacrificing backwards compatibility with existing C code. Device information is maintained in the class container, togerther with all necessary functions. Common code can be brought into lower base classes, enabling the sharing of the code by virtue of the inheritance mechanism of C++. It is easy to define a base interface prototype in C++ which can be used in your application code, and then use polymorphism to link your interface prototype to your device implementation. Code migration becomes very easy – your application can be brought from, let’s say STM32 to LM3S, and the only thing that you must do is develop a new interface implementation. There are compile-time enhancements in C++, such as classes, virtual functions or namespaces, which are completely benign and which in most cases will not contribute to bloat. They are part of the framework that enables programmers to scale their software concepts to larger dimensions without losing overview. In larger programs, C++ will most likely lead to more compact code – see this example at GCC compiler family, but this story is also applicable to KEIL and IAR users. Compile your code with the -fno-rtti -fno-exceptions flags (the others such as -ggdb aren’t relevant to this discussion but I included them anyway). My compiler lives on a FreeBSD system and is therefore placed in /usr/local/bin. I named it arm-eabi instead of the more common arm-none-eabi. This may be different on your system. When using Linux, for example, every distro seems to have its own peculiar spot to place applications. LISTFILE, OBJECTFILE AND CPPFILE are of course to be properly named by you. This stops C++ from automatically inserting exception handling (and all other stdc++ library components) in your object file. But, this isn’t the complete solution! Even with the insertion of -fno-exceptions at compile time, you will still get exception handling (and therefore bloat) when using C++ features such as new or delete. You will need to instruct the linker that it, too, should avoid all bloat components. Functionality not found in libc.a such as new or delete must be provided by you – this is the price you pay for not using libstdc++! This, however, is not very difficult to do. In C++, you can use overloaded methods to insert your own version of new and delete:. I have an article that outlines how to write these functions. Ik ben in 2010 lid geworden va de VVD omdat ik ik vind dat iedereen in dit land mag zeggen wat hij of zij vindt, ongeacht het onderwerp. Met name de zich steeds meer roerende religieus geïnspireerde medemens moet in de openbare ruimte op afstand worden gehouden, omdat het algemeen belang (dus ook het belang van niet-gelovigen) niet gediend is met mondsnoeringen van welke aard dan ook. Zolang ik bij godslastering niet verkondig dat anderen god niet mogen aanprijzen, belemmer ik hun niet in hun meningsuiting. Omgekeerd doen zij de religieuzen dit wel, door het strafrecht (niet niet de Sharia, maar ons onpartijdige, boven religies verheven strafrecht) in te zetten voor de vervolging van mensen met wie zij het niet eens zijn. Blijkbaar is hun vrijheid belangrijker dan mijn vrijheid. En nu schaart ook de liberale VVD zich in de rij van partijen die de vrijheid van meningsuiting van religieuzen belangrijker vinden dan die vrijheid van meningsuiting van anderen – de VVD laat deze discriminatie van een van haar eigen beginselen gewoon gebeuren. Ik vind dat de VVD zich aan haar beginselen moet vasthouden bij de dagelijkse politieke besluitvorming. Als de partij zwicht voor de orthodoxe drammers van de SGP, dan zijn de eigen principes blijkbaar minder belangrijk dan de greep op de regeringsmacht. 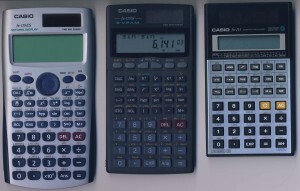 Recently I purchased a new calculator because someone pointed out to me the truly amazing capabilities (natural textbook display) of Casio’s new fx-115ES calculator. Costing under €30, the calculator offers an astounding 403 functions, conversions and solvers. It also displays fractions as true fractions, in addition to the standards floating point display format.. It can handle tables for linear or cubic interpolation for which the data entry is pretty easy. It performs numerical differential and integration, and solves equations with Newton-Rapson. It can even do (limited) vector and matrix calculations. 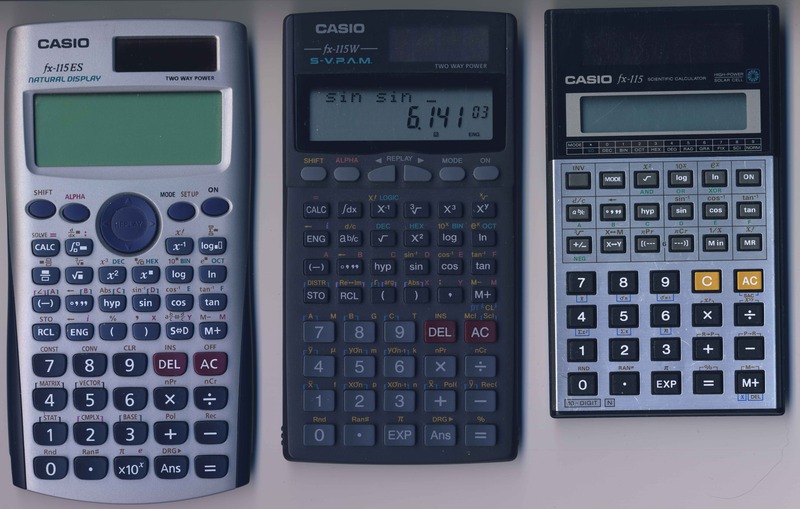 Even though I am a big fan of Texas Instruments integrated circuits (especially their MSP430 microcontrollers, their ADCs (ADS1178) and power ICs (TPS84620) ) I prefer Casio’s calculators over TI’s. They are not as bulky, you can get your results more quickly and they cost a lot less. When I got the new calculator , I realised I had purchased the fx-115 before. The first model I got was the fx-115 in 1985, when I was in school. Later, it also served me well as a student at Delft University of Technology. Looking for a model that would help me with complex numbers, I bought the fx-115W when I worked at Oresis Communications in 2001. This was my main computational workhorse in the new millennium. And, this year I purchased the amazing fx-115ES. In a way I have been quite intimate with the fx-115 family for 26 years! All calculators, including the 26 years old fx-115, still work flawlessly, a testimony to Casio’s build quality. Begin solar driven, I never had to replace a battery. The fx-115 now lives in a kitchen drawer and is used for domestic purposes.